Guess what? It’s time for another round of Secret Recipe Club! My assigned SRC buddy for this month is Lisa at Cook Lisa Cook. 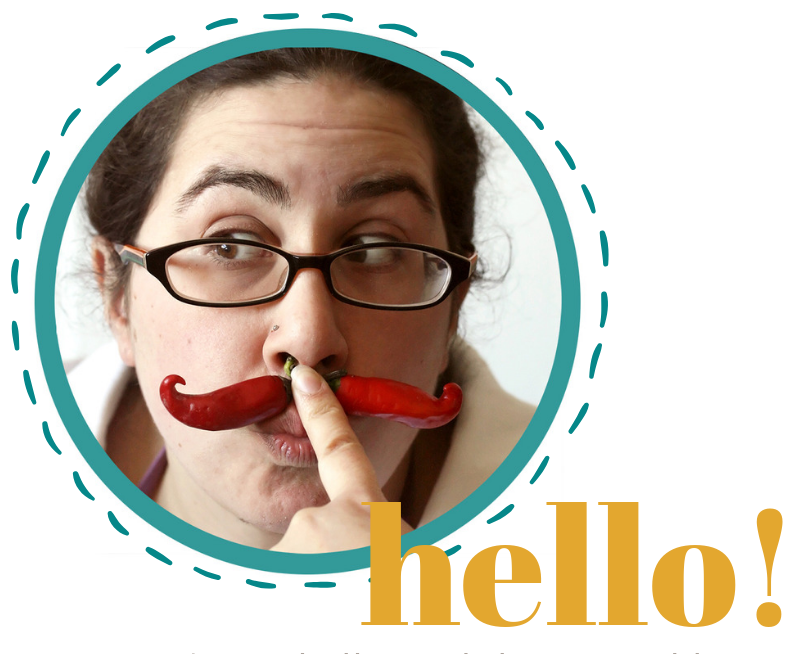 Lisa’s blog is a relatively new one for me, though I’ve visited a few times during past SRC reveals, so I was really excited for the opportunity to spend a little time exploring her blog and picking a good recipe. As always, I had a hard time choosing what to make. 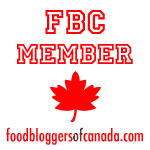 Lisa’s been blogging for since 2005 (which is even longer than me!) and covers a wide range of cuisines and courses, so there’s quite the selection of dishes to choose from. I was seriously tempted by her recipes for Upside-Down Mango Cake and Five-Spice Chicken Wings, both of which sounded absolutely delicious, and briefly considered taking on the challenge of making her Grilled BBQ Octopus before filing it away for another day. Djerba’s version of the dish was a simple pan-seared trout rubbed with a coriander spice blend and blanketed with a rich beurre blanc sauce flavoured with lemon and cilantro, while Lisa’s recipe replaces the delicate trout with meatier salmon filets and tops it off with a bright tangy yogurt-tahini sauce. 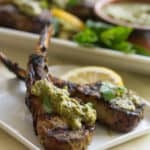 One is rich and buttery, and the other is fresh and light, but once you get past those initial differences, there’s still a common element that unites both dishes – namely that irresistible dichotomy of grassy coriander seed and green cilantro leaves. As usual, I did make a few changes along the way. 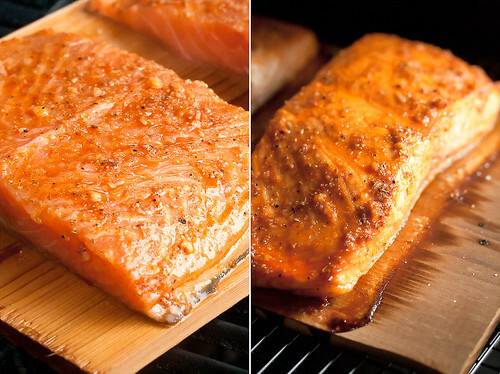 The biggest change was in the cooking method – it was simply too hot and muggy to turn on the oven when I made the dish last weekend, so I decided to cook my salmon on a cedar plank in the barbecue instead. 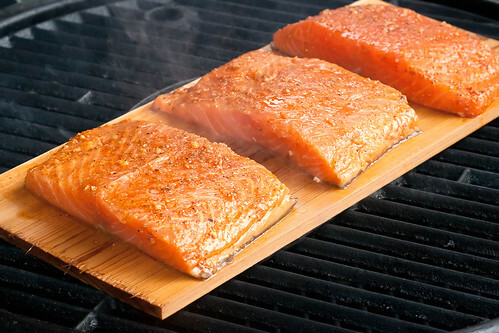 Planking is a fantastic technique for preparing fish on the grill… the cedar imbues the salmon with a subtle woodsy flavour as it cooks and protects the fish from the heat of the grill, leaving the filets beautifully flaky, moist and ever-so-faintly smoky. Plus you can basically serve up the fish right from the plank, which makes for a really impressive presentation if you’ve got company. 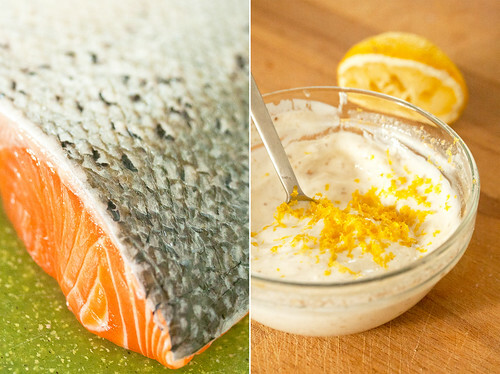 The salmon came out of the barbecue beautifully moist with a sweet and smoky flavour from the marinade that was enhanced by the planking, which paired perfectly with the cool, tangy yogurt sauce that we spooned overtop. It’s almost nothing at all like the dish that prompted me to try this recipe in the first place, but it’s absolutely delicious nonetheless. We ended up serving it up with a bright yellow tumeric-scented Israeli couscous and slices of fresh cucumber, which made for a perfect summertime supper on a stiflingly hot day. Considering we’re trying to eat more fish these days, I’d say this one is definitely a keeper. Thanks, Lisa! 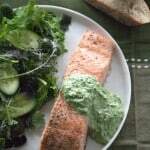 A light cilantro-spiked yogurt sauce gives a fresh summery boost to the generously spiced roasted salmon. About 1 hour before you're ready to fire up the grill, place the cedar planks in a large pan of water to soak. In a small skillet set over medium-high heat, toast the coriander seeds for 1-2 minutes, or until fragrant. Let cool for a few minutes, then grind finely using a spice grinder or mortar and pestle. In a small bowl, whisk together 1 tsp of the ground coriander with yogurt, tahini, lemon juice, garlic and lemon zest until smooth. Stir in cilantro, then season to taste with salt and pepper. Cover tightly with plastic wrap and refrigerate until ready to serve. In a small bowl, whisk together honey, lemon juice, garlic, olive oil, paprika and remaining ground coriander. 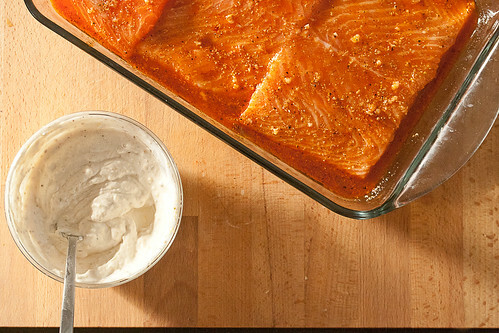 Arrange the salmon filets in a large glass baking dish, and pour the honey sauce overtop. Cover tightly with plastic wrap and transfer to the refrigerator to marinate for at least 15 minutes (but no more than 1 hour). Preheat grill to medium-high heat. Arrange the salmon filets skin-side down on the soaked planks, spacing them at least 1" apart. Pour the remaining marinade in the dish into a small bowl and reserve. Transfer the planks to the preheated grill. Close the lid and cook for about 10-15 minutes, or until the salmon is opaque and flakes easily with a fork, brushing with reserved marinade about halfway through. To serve, plate the individual salmon filets, then top each one off with a generous spoonful of sauce and garnish with a sprig of cilantro. 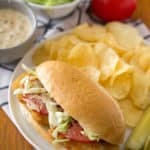 I bought a cedar plank years ago for the bbq but have always been so scared to try it…this recipe looks great and am going to give it a try with basa using the cedar plank! Great SRC pick! I have never tried plank cooking. I will have to look into it because this looks delicious. My mouth is watering. I want this for dinner now. 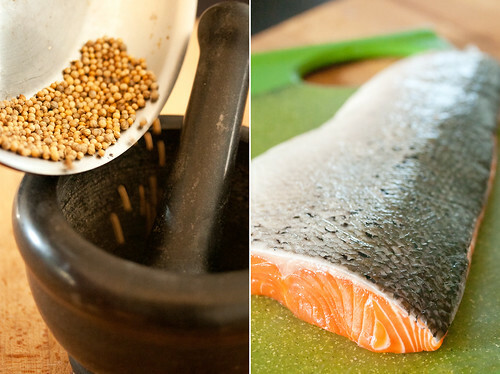 Coriander seems to go really well with salmon, so I bet this is really delicious! Especially cooked on a plank! Yum! We are not fish eaters, much though we’ve tried to be. And when I see beautiful photos like this, it makes me wish I could get past the texture so much more! The dish looks wonderful! Beautiful! Never thought a piece of salmon could be so pretty. You are a salmon artist, my friend. :) Wonderful photos. That looks so delicious! Lovely photos too, had me drooling! From a fish HATING family…. I could almost make myself try that. It looks delish!!!! Thank you so much for your kind words and you picked one of my favorite recipes. 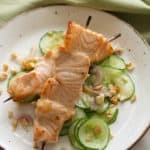 Your salmon looks just gorgeous, I want to take a fork and enjoy a bite or more. I’m going to give your cooking method a try the next time I make this dish, I’ve never cooked on a plank but it sounds wonderful, flavor wise and not heating up my kitchen. Such a great choice, this salmon is so up my alley. Beautiful pis too! We have salmon weekly and I always am looking for new recipes. This one sounds like a winner. Gorgeous salmon! What a great choice for SRC! Love this! I’m always looking for new ways to prepare salmon. Would you believe that I have a big filet of salmon in my fridge for tonight? I was going to do my standard sesame roasted version but you may have just changed my mind! 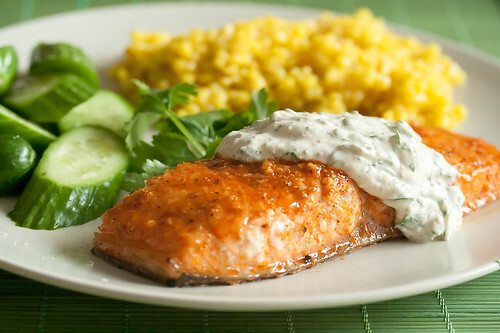 I love salmon, and I love sauces, so this is a perfect combo for me! Great choice for SRC!